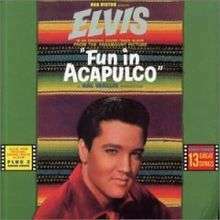 Fun in Acapulco is the nineteenth album by Elvis Presley, released on RCA Victor Records in mono and stereo, LPM/LSP 2756, in November 1963 – the November 1 date is disputed. Recording sessions took place at Radio Recorders in Hollywood on January 22 and 23, 1963; and at RCA Studio B in Nashville, Tennessee, on May 26 and 27, 1963, we worked on the Movie "Tickle Me".. It peaked at number three on the Top LP's chart. The album, along with the accompanying film, would be Presley's last release before the arrival of Beatlemania. The third of his tropical "travelogue films" for Paramount Pictures after Blue Hawaii and Girls! Girls! Girls! finds Elvis frolicing in Mexico. The standard stable of songwriters for Presley delivered songs to match, with titles like "Marguerita," "El Toro," "You Can't Say No In Acapulco," and "The Bullfighter Was A Lady." Included as well was the 1937 standard "Guadalajara" by Pepe Guízar. With the change from the normal routine, and with the addition of trumpet players Rudolph Loera and Anthony Terran, Presley engaged the material with greater enthusiasm than on recent soundtrack outings. Four of these songs would be included on the 1995 compilation Command Performances: The Essential 60s Masters II: the title track, "Mexico," "Marguerita," and the song released as the lead single, "Bossa Nova Baby". "Bossa Nova Baby" arrived in stores one month prior to the soundtrack, coupled with the track "Witchcraft" by rhythm and blues songwriter and arranger Dave Bartholomew and a hit for The Spiders in 1956. The fact that the bossa nova craze of the 1960s was a Brazilian phenomenon rather than a Mexican one mattered little, as the single peaked at number 8 on the Billboard Hot 100 as well as reaching as high as the 20th spot on the R&B singles chart. Compensating for the short ten-track It Happened at the World's Fair album, Presley's manager, Colonel Tom Parker, insisted on making Fun in Acapulco a good value. Two additional tracks, "Love Me Tonight" and "Slowly But Surely" were pulled from the aborted album sessions of May 1963, and added here to bring the running order up to thirteen tracks. ↑ "Bossa Nova Baby". Elvis - The Music. Sony Music Entertainment. 2015. Retrieved September 22, 2015. ↑ Jorgensen, Ernst. Elvis Presley A Life in Music: The Complete Recording Sessions. New York: St. Martin's Press, 1998; pp. 184. ↑ "Fun in Acapulco". Elvis - The Music. Sony Music Entertainment. 2015. Retrieved September 22, 2015. "Follow That Dream releases". For Elvis Fans Only. Elvis Australia. Retrieved January 22, 2015. "Fun in Acapulco". Shopelvis. ABG EPE IP LLC. 2015. Retrieved January 22, 2015. ↑ Whitburn, Joel (2007). Top Pop Singles 1955–2006. Record Research. pp. 669–674. ISBN 978-0-89820-172-7. ↑ Whitburn, Joel (2006). The Billboard Book of Top 40 R&B and Hip-Hop Hits. Billboard Books. ISBN 978-0-8230-8283-4.